Windows 8.1 boasts of a number of new features that were missing from Windows 8. It has also removed a number of flaws which had left the users unhappy with the new OS. But not everyone might be able to enjoy this new shiny new OS. Windows 8.1 is a great addition and upgrade to Windows 8, whether you want to admit it or not. It offers new features, changes functionality and does attempt to change consumer’s minds on what Windows 8 is all about. If you’re using an older PC, you may find yourself stuck between Windows 8 and Windows 8.1 during the upgrade process with no operating system to use legally. Windows 8.1 changed the hardware requirements in such a way that if you don’t have CMPXCHG16b (CompareExchange128) CPU support for the 64-bit version of Windows 8.1, you’re stuck. The problem goes deeper than that, and we’ll elaborate on this issue further. Windows 8.1 was considered by most to be a Service Pack-style update for Windows 8. While Microsoft has released Windows 8.1 on DVD and as a streaming download for those looking to upgrade from Windows 7 or earlier, those with Windows 8 already installed assumed the upgrade process would be relatively easy. Boy, were they wrong! When updating from Windows 8 to Windows 8.1 on an older machine, if the system didn’t support the 64-bit version of CMPXCHG16b automatic memory exchange, they wouldn’t be able to upgrade. This isn’t something most computer users, even expert ones, might know off the top of their head. They’d find out in the middle of the upgrade process. That’s where the trouble begins. This is a troubling way to shut out a whole segment of users from upgrading to Windows 8.1. For those using a PC that doesn’t support the CMPXCHG16b protocol, they may find themselves in an upgrade/downgrade loop. While the CMPXCHG16b protocol has been in place for years now, it’s not something even a tech savvy person would think might affect an update to a primary OS like this. 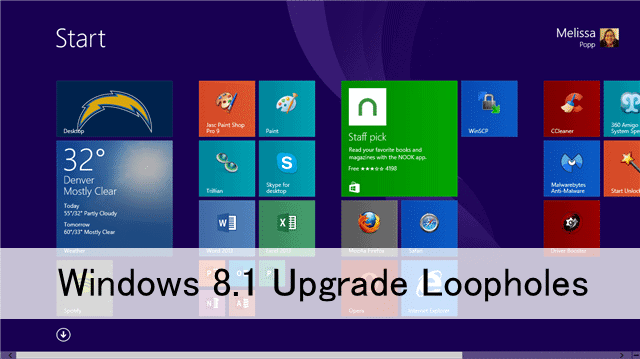 Until you run the Windows 8.1 upgrade, you might not even realize you’re affected. In fact, Microsoft didn’t even bother to let Windows 8 users know that the issue existed or that it might be an issue for them. You can’t find this information in the spec requirements for Windows 8.1 or anywhere on Microsoft’s website. The latter suggestion will prove difficult, depending on whom you speak to at Microsoft to troubleshoot Windows 8.1 upgrade concerns. If you bought the 64-bit version of Windows 8, it doesn’t include a downgrade to the 32-bit version even if your Windows 8.1 upgrade failed. If you escalate far enough up the chain of command in a Microsoft call center, you may get lucky, but we’ve heard no such success stories yet. Please Note: This only will be an issue if you’re using the Windows 8 64-bit version. If you’re running the 32-bit version, you should be able to upgrade regardless. However, if you run into any issues, we recommend reaching out to Microsoft as it may be a bigger issue than what we’ve detailed above. Unfortunately, this change in requirements to use Windows 8.1 wasn’t officially released. Microsoft claims users should’ve known about it all along because of how long the CMPXCHG16b CPU protocol has been around, but that’s a ridiculous excuse for forcing users to potentially be locked out of a Windows 8 major update. After all, Microsoft didn’t realize a new OS, did they? They just released an update similar to a Service Pack but for whatever reason, they’re refusing to just call it a Service Pack. Microsoft has made misstep after misstep with Windows 8 since launch day and this upgrade loophole is just another one of them. Have you had issues with the Windows 8.1 upgrade? Share them with us below! We can help walk you through issues, troubleshoot on your behalf and perhaps find solutions that even Microsoft hasn’t found yet. Let TechNorms help you!